A shortbread batter is so versatile. Sometimes it's pressed into a tart or cake pan or used to make cut out cookies. Other times it's rolled into a log and used to make slice and bake cookies. But for this recipe we are making delicious Raspberry Shortbread Bars. Just think, two buttery layers of sweet shortbread sandwiched together with a tart and tangy raspberry jam. A match made in heaven. For these shortbread bars I like to prebake the bottom layer of shortbread. That way the bottom crust stays wonderfully crisp. Then, after spreading the raspberry jam over the baked crust, I like to scatter clumps of the batter over the jam, instead of having a solid layer of shortbread. I do this because I think it looks quite appealing, but also so you can easily see that there is a layer of raspberry jam underneath. For the jam, you can use either a good quality store bought raspberry jam (or preserve), or you can make your own. I have a quick and easy recipe, with a video, on how to make your own refrigerator raspberry jam. 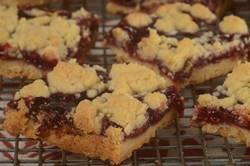 I like to make the jam at least the day before I make these shortbread bars as I think the flavor improves overnight. And really, you could replace the raspberry jam with another flavor of jam or you could even mix some apricot jam (preserves) into the raspberry jam to make Raspberry Apricot Shortbread Bars. Raspberry Shortbread Bars: Preheat your oven to 350 degrees F (180 degrees C) and place the oven rack in the center of the oven. Butter (or spray with a non stick cooking spray) a 9 inch (23 cm) square baking pan. Evenly press about two-thirds (370 grams) of the shortbread onto the bottom of the prepared pan. Lightly prick with the tines of a fork. Bake the shortbread about 16 - 18 minutes or until light brown. Remove from oven and evenly spread the raspberry jam over the shortbread base, leaving a 1/4 inch (.5 cm) border. With the remaining shortbread dough, using your fingers, crumble it over the top of the raspberry jam. Then lightly press the dough into the jam.